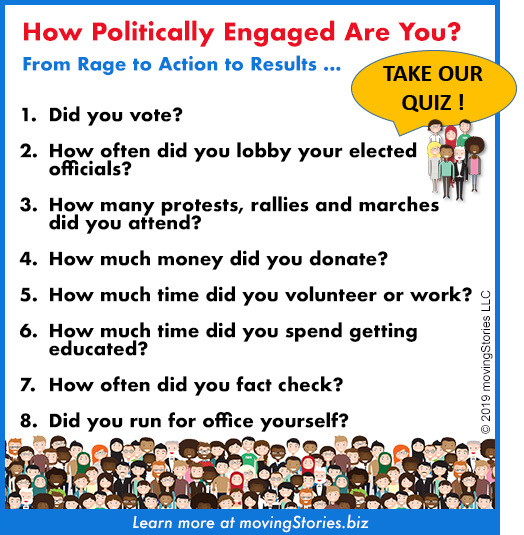 How Politically Engaged Are You? TAKE THE QUIZ: How Politically Engaged Were You in Support of the November 2018 Midterms? Being political means caring. Caring about how our American democracy affects all of us. And knowing that we have the power to shape our government so that we are more united, fair and prosperous. Here’s a simple quiz to measure how politically engaged you were in support of the November 2018 midterms. This quiz has little to do with how much you love your country but measures how active you were in helping to improve how we all live together on planet Earth. It all starts with individual action. But the real power comes when we work together, reaching a critical mass of humanity rising. Answer the questions below, add up your points and check your rating. Did you vote in the November 2018 midterms? How often did you lobby your elected officials in 2018? How many protests, rallies and marches did you attend in 2018? How much money did you donate in 2018 to campaigns, citizen-action groups, political parties and related organizations? How much time did you volunteer or work for candidates, citizen-action groups and/or other political activities in 2018 (PER WEEK)? How much time did you spend in 2018 getting educated on the issues (PER DAY)? Did you run for office yourself in 2018? 0 points = We welcome you to join us and get engaged! You will not believe how good it feels. 5 to 50 points = Pat yourself on the back! Your push made a difference. 55 to 80 points = Three cheers for you! You went above and beyond. Need some ideas for how to get more engaged? Here’s a place to start.